I am a huge fan of King Arthur Flour and their products and recipes. After looking through their recipes looking for some kind of bread to make that didn’t require many ingredients, I decided to attempt homemade bagels for the first time. 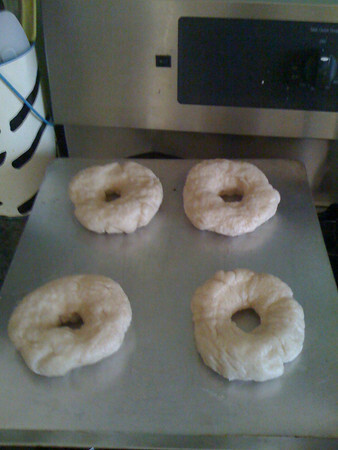 The recipe requires making a dough (I used my bread machine dough setting), resting the dough, shaping the bagels and boiling them, and then a final baking. I added all of the ingredients to the bread machine and let it do its thing. I weighed the resulting dough and tried to split it into eight equal-weighted pieces (though I ended up with nine). 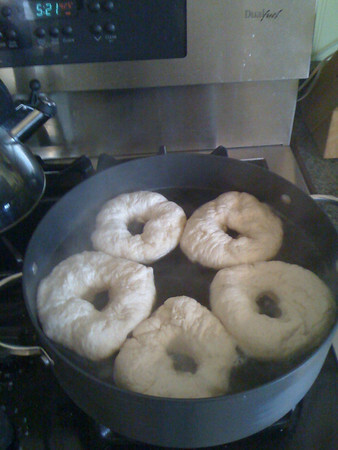 After letting the dough rest for 30 minutes, I poked holes in them and shaped them into the standard bagel shape and added them to the boiling water for 3 minutes (2 minutes on one side, 1 minute on the other). 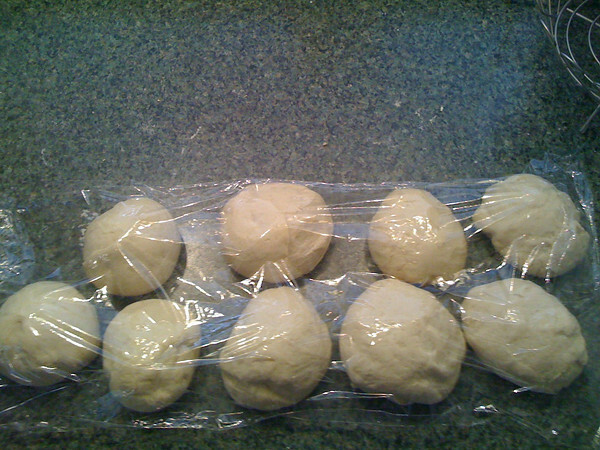 After removing them from their refreshing, warm bath, I placed them on baking sheets in preparation for the oven. 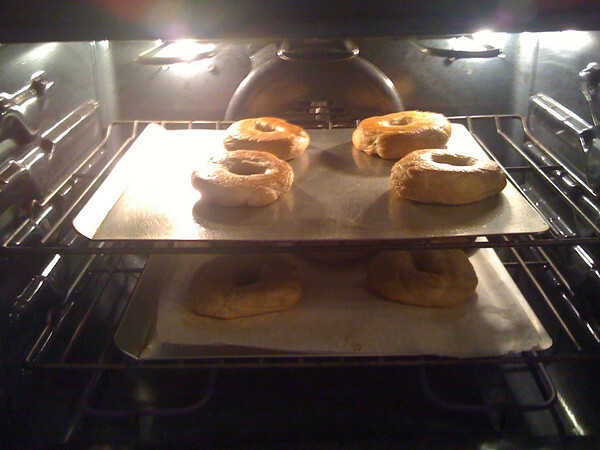 They were baked in the oven at 425 degrees for 25 minutes flipping them once during the baking (the wet bagel dough from the bath makes the oven shoot out a nice bit of steam when you open the door, be careful when flipping them). After removing the finished product and letting them cool, we finally got to taste them. They tasted great and even received the Casey seal of approval so this recipe is a keeper. This recipe was incredibly easy to make so I highly recommend giving it a try even if your baking skills are somewhat limited. You will be very pleased with the results. 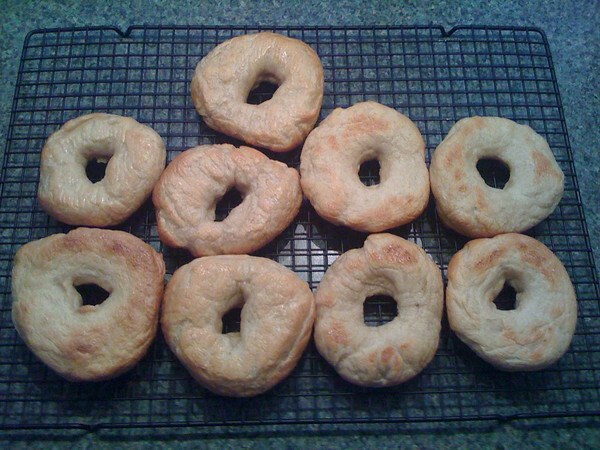 This entry was posted in Recipe and tagged bagels, king arthur flour, Recipe. Bookmark the permalink. A couple of friends of mine are driving to the King Arthur place to grab some of their 100yr old starter. I can snag you some if you really want, Doug.